Sometimes foodie experiments turn out well and sometimes they don't. The Scotch Eggs I'm sharing with you today were a big success. It was only after they'd been devoured and a quick Instagram snap of them generated a lot of interest that I realised that they were most definitely worthy of a blog post. As an interim measure I shared the recipe on my Facebook Page and it produced lots of likes, shares and general excitement. Sometimes I think I should concentrate purely on Tunnock's Teacakes, Gin, Irn Bru and Haggis as these always seem to be the things that grab attention on my social media channels! Perhaps I have a disproportionate amount of Gin drinking Scots in my audience?! Prior to these I think the first and only time I've ever made a Scotch Egg was in 'O' Grade Food & Nutrition. As I recall it took longer to clean the deep fat fryer afterwards than it took to make the actual Scotch Egg. These are undoubtedly much healthier than a deep fried version and the double coating of panko breadcrumbs give a fantastic crunch. A good quality, not too fatty, Scotch Beef sausage will make all the difference. They taste equally good cold as they do straight from the oven and are most definitely not just for Burns Night. Place a hard boiled egg in the middle and draw up the clingfilm around it. Shape into a ball easing the sausagemeat to completely cover the egg before peeling away the clingfilm. Repeat for the other 5 eggs. Dip each meat coated egg into the beaten egg, then the panko and repeat so each has a double coat. Place the Scotch Eggs on a baking tray, spray with fry light (or drizzle with oil) and cook at 200c for 25-30mins. Some more of my Quirky Scottish Recipes that may well have Rabbie turning in his grave can be found in this post 25+ Quirky Scottish Recipes. Expect cotch Beef, Irn Bru, Tunnock's Teacakes, Haggis, Scottish Salmon, Tattie Scones, Whisky, Shortbread, Arbroath Smokies, Scottish Gin and more. For more Haggis of all persuasions you'll be needing My Top 10 Haggis recipes for Burns night. What a genius idea. Do you think I could burrow it? Problem is that I'm not a whisky drinker myself. Plenty of great Scottish Gins though. These look absolutely gorgeous, I loved the veggie haggis Scotch Eggs I made and I'm sure these would also be very tasty. I'm getting a lot of traffic for Scottish recipes too, so am going to do more of them! 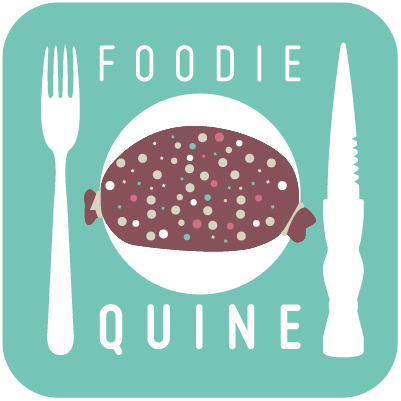 We've got such a wonderful larder here in Scotland so its great to be able to showcase it to a wider audience. 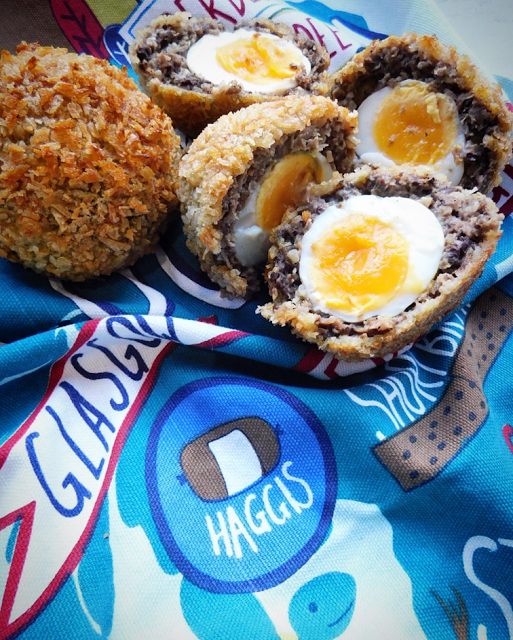 These look fab, loving the haggis twist that you've put on it. Thanks Jemma, the haggis and the panko really make them special. Indeed they do taste fab, both hot and cold. Your Cullen Skink recipe is great too. I've got a 10 month old who's rather partial to a scotch egg! These look fab. 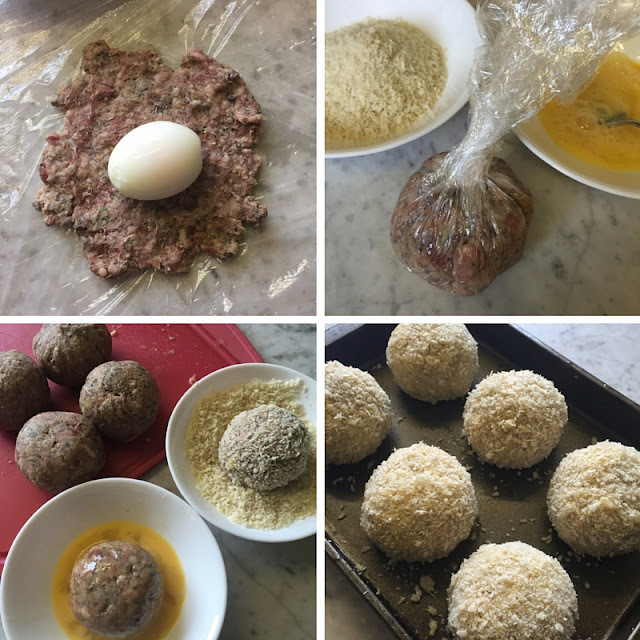 Never tried making scotch egg before - will have to give it a go. They are much easier to make than you would imagine and the trick with the clingfilm works so well. Pretty much anything with haggis in it is awesome to me! How do you think these would taste with pork sausages? I'm sure they would work really well. Let me know how you get on.